Since its appearance nearly 35 years ago, Black's New Testament Commentary Series has been hailed by both scholars and pastors for its insightful interpretations and reliable commentary. Each book in the series includes: an insightful introduction to the important historical, literary, and theological issues; key terms and phrases from the translation highlighted in the commentary where they are discussed; explanations of special Greek or foreign terms; references to important primary and secondary literature; and a Scripture index. Designed to make the latest scholarship on Philippians accessible to a broader readership, this new commentary brings to life both the letter's historical setting and its vigorously theological purpose. A number of important recent studies of the social and religious context of first-century Philippi are here considered for the first time in a commentary, and the author offers a critical engagement with several of the newer approaches to Pauline interpretation, including questions of rhetoric and social convention. Theological highlights include the themes of Christian joy in all circumstances, the Philippians' active 'stake-holding' partnership in the gospel, and above all the pervasive passion for a union with Christ in following his self-humbling example of service. Giving due attention both to the theological heritage of St. Paul's Jewish background and to the Greco-Roman social and religious setting of his readership, this commentary relates a well-grounded understanding of the letter's first-century impact to the wider concerns of Christian theology. - Publisher Black's New Testament Commentary series presents a reliable and enlightening exposition of the New Testament for the modern reader. Written by highly respected biblical scholars under the editorial direction of Dr. Henry Chadwick, each commentary offers a paragraph-by-paragraph exposition based on the author's own, fresh translation of the biblical text. Other features include: insightful introductions to the important historical, literary, and theological issues; key terms and phrases from the translation highlighted in the commentary where they are discussed; explanations of special Greek or foreign terms; references to important primary and secondary literature; and a Scripture index. Pastors, students, scholars, and general readers will all agree that this series is a welcome and essential aid to a better understanding of the New Testament. Book jacket. 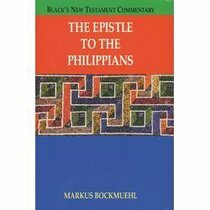 About "The Epistle to the Philippians (Black's New Testament Commentary Series)"
Black's New Testament Commentary series presents a reliable and enlightening exposition of the New Testament for the modern reader. Written by highly respected biblical scholars under the editorial direction of Dr. Henry Chadwick, each commentary offers a paragraph-by-paragraph exposition based on the author's own, fresh translation of the biblical text. Other features include: insightful introductions to the important historical, literary, and theological issues; key terms and phrases from the translation highlighted in the commentary where they are discussed; explanations of special Greek or foreign terms; references to important primary and secondary literature; and a Scripture index. Pastors, students, scholars, and general readers will all agree that this series is a welcome and essential aid to a better understanding of the New Testament. Book jacket. Markus Bockmuehl (PhD, University of Cambridge) is a fellow of Keble College and professor of biblical and early Christian studies at the University of Oxford. He previously taught at the University of Cambridge and the University of St. Andrews. He is the author or editor of a dozen books, including Seeing the Word, Jewish Law in Gentile Churches, Philippians (Black's New Testament Commentary series), This Jesus: Martyr, Lord, Messiah, and editor of The Cambridge Companion to Jesus, and translator and editor of Stemberger's Introduction to the Talmud and Midrash.